Have you ever wanted to travel through space at hyper speeds? Well when you play the new Microgaming slot game Battlestar Galactica you will get just that. The game is based off of a multiple TV Shows that have been running for more than seven years now and the TV Show is based off of a movie that came out way back in the early 80’s. The TV Shows, Movies and games have gained a loyal following from sci-fi fanatics all around the world. Microgaming offers players all across the net their new 243 Payline slot games. These games contain 5 reels with 243 Paylines. Other games that are available in this series of slots is Thunderstruck II, The Finer Reel and Immortal Romance. All of these games offer outstanding visually impressive games with spectacular sounds that make you feel like you’re in the game and show. You will see lines from the movie scripts appear in the slot game along with animations from the TV show such as the background changing colors that feel familiar to the TV Show, Spaceships flying all across you’re screen and much more. On the reels for this beautiful game you will find all the famous characters from the TV Show appear on it such as Colonel Tigh, Apollo, Gaius Baltar and many others. You will also see extra bonus symbols but these are the standards Q, K, A, J, 9 and 10. Just like every slot game the game comes with extra added slot features that will change randomly depending on what you do. These in game slot features are all unique though and there called The Fight Feature or The Run feature. While you’re playing the run feature you will be able to gain winning combinations from right to left and left to right, you can change normal symbols that you would find in this game such as numbers or letters and turn them into the characters symbols. This will award you with more winning combinations which means more money. During the fight mode you will be given up to free 5 spins and each time you click the spin button it will randomly change up the symbols to multipliers. While you’re playing a multiplier every win you receive will be times by three. Every single Microgaming slot game gives you a wide arrange of options to choose from in concerns with you’re wager. 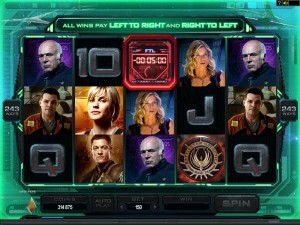 The smallest wager you can commit in the Battlestar Galactica Slot game is $0.30 with the maximum wager being $15. You also have the wonderful choice of spending $0.01, $0.02 or if you want $0.05 on every line with the maximum of ten coins per line. The wonderful thing about this is that this allows for Microgaming to appeal to a larger audience like low rollers, high rollers and medium rollers. The medium players do tend to get the most out of the game since they wager a good amount and win a good amount in return. 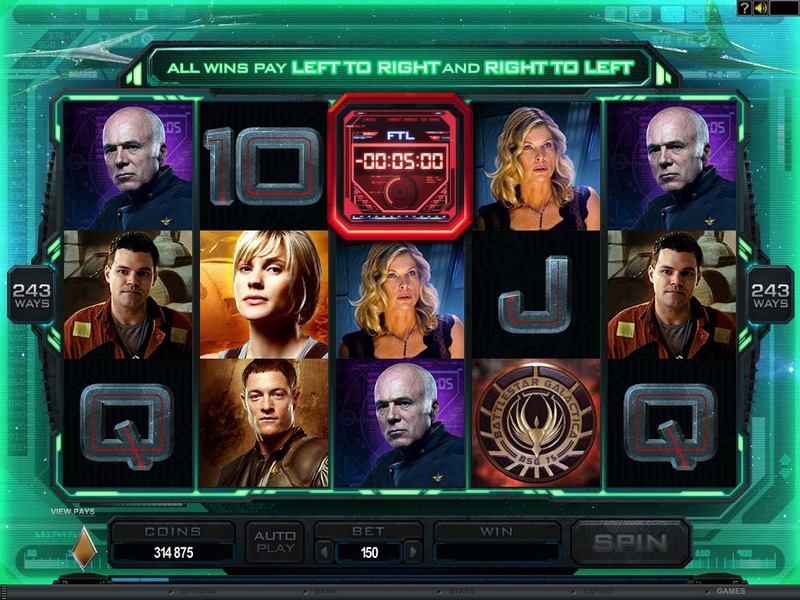 Microgaming truly outdid themselves with the Battlestar Galactica Slot Game and how the design of the game is portrayed in its theme. Microgaming has truly perfected the thrill and feel of Battlestar Galactica in their game which brings all the die hard sci-fi fans to the online gambling industry. This causes a gap in two major industries to become one and bridge them together. The game is absolutely stunning and will not disappoint you what so ever.